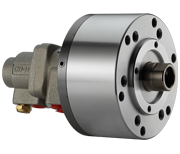 These Autogrip rotary cylinders are designed with a coolant connection, which delivers coolant from the rear of the distributor through a rotating unit. The rotary cylinders are closed center and require a drain port to be independently connected to the oil tank. A built-in pressure relief valve ensures a safe operation at all times.